Rainbows personify joy. The seven arcs of different colors stroked across the sky after a storm represent one of the most delightful and resplendent visuals nature can create. The question is, how does she paint such a masterpiece? 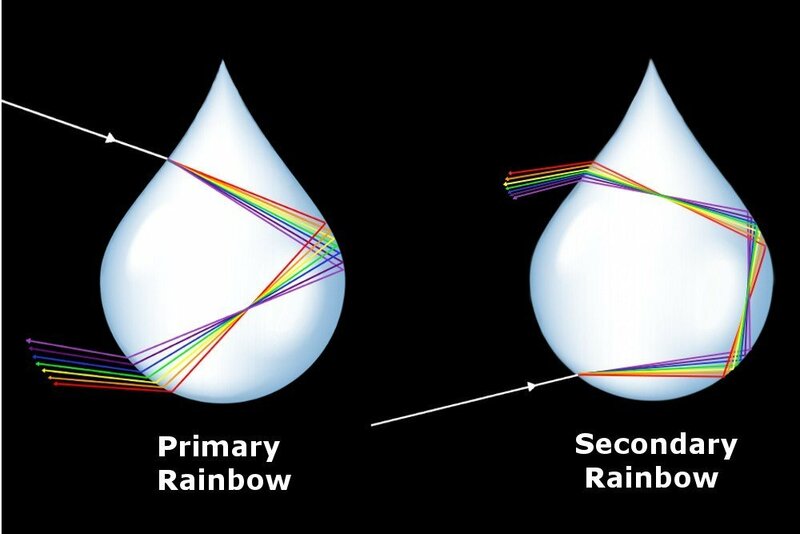 Rainbows are created when raindrops suspended in the air act as prisms and split the white sunlight incident on them into light’s seven constituent colors. The seven colors – as seen from top to bottom — red, orange, yellow, green, blue, indigo and violet are radiated by the drops as seven contiguous arcs that we collectively call a rainbow. However, the physics can perform this magic only if certain key conditions are met: the Sun and the cloud showering the droplets are situated opposite to each other, such that the observer’s gaze is upon the cloud while the Sun shines on his or her back. With a different alignment, the rainbow cannot be observed. It is worth emphasizing that it’s not that the rainbow isn’t formed, but instead that it cannot be observed by the observer who, for example, is gazing at the Sun. You will understand why in a moment. For this reason, observations are favorable at 4 in the afternoon or 8 in the morning, when the Sun is behind us. 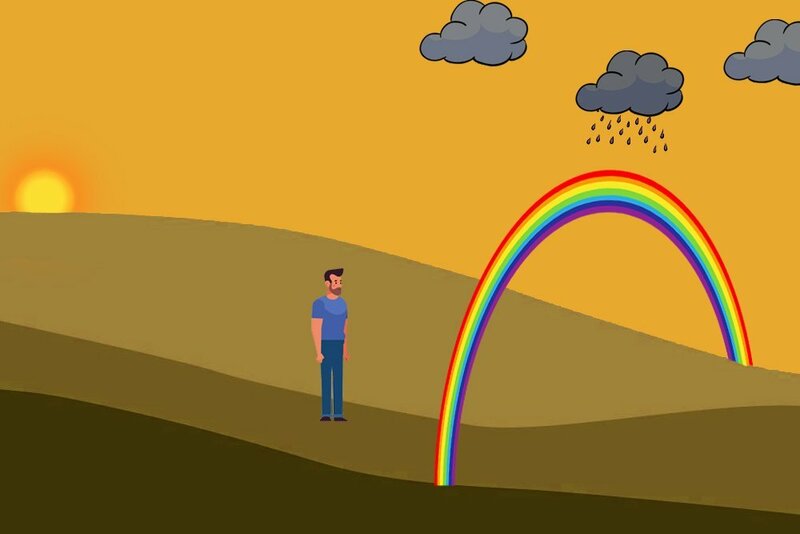 Now, let’s examine precisely how a rainbow is formed. In 1666, Newton demonstrated that the waves of white sunlight entering through his window and crashing upon a prism split into seven distinct colors. 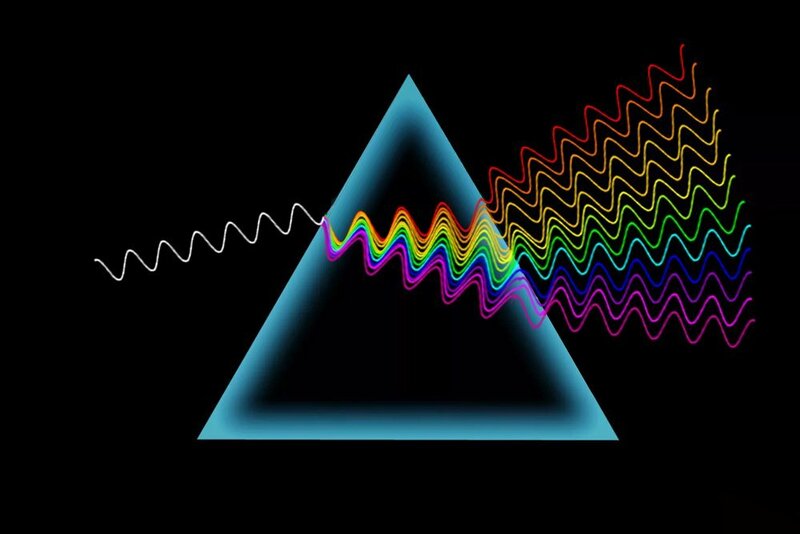 Newton realized that white light is actually a combination of different colors, and the prism had split that singular light into its constituent colors. While every color that exists spurts from the point of contact, only seven can be distinctly perceived. The speed of light is a cosmic limit for how fast any object can travel. However, light travels 300 million meters per second only in a vacuum, such as space. In another medium, such as air or water, light slows down. When light enters the prism, it bends and slows down, as the crystal doesn’t permit it to travel as effortlessly as it does in empty space. This is called refraction. Unlike reflection, the refracted light doesn’t bounce back from the surface, but instead penetrates and undergoes a change in speed, depending on the properties of the medium. In fact, when the light exits the denser medium and re-enters the lighter medium, that is, when it exits the prism from the opposite side, it refracts again, but now, instead of bending, it ascends. The lighter medium offers less resistance, thereby allowing the light to regain its incredible velocity. You have likely experienced that, due to inertia, a speeding car is far more difficult to turn than a slow-moving car. White light is a medley of wavelengths, and the prism splits it because some wavelengths travel slower and therefore bend more than the others. The wavelength of light that we perceive as red travels the fastest and naturally bends the least. The wavelength of light we perceive as orange travels slower and therefore bends slightly more than red does. Similarly, the successive wavelengths travel increasingly slower, and are thus increasingly bent. Finally, violet travels the slowest and naturally bends the most. Bear in mind that every wavelength and therefore every color that exists between red and violet increasingly bends, but only the primary seven are conspicuous. Raindrops suspended in the air “split” the sun’s light in a precise manner. However, not only must the Sun illuminate your back, but to be peeled off a color, the light must strike the drops at a particular angle that corresponds to that color. The angle is measured with respect to the line of sight of the observer. The color red is peeled away when the sunlight strikes a drop at an angle of 42 degrees, whereas violet is peeled away when the angle formed is 40 degrees. The rest of the colors are peeled away when the angle lies somewhere between 42 and 40 degrees. 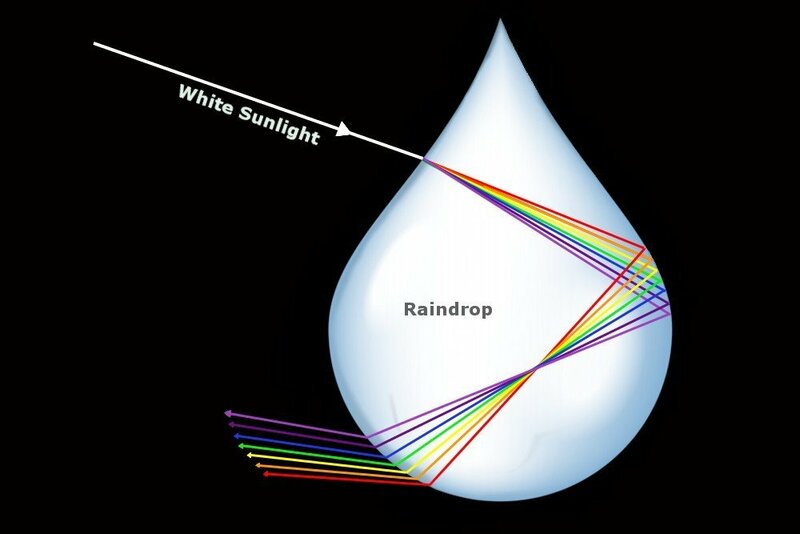 The bent, contiguous stripes of colors travel to the opposite side of the drop, where some light refracts and therefore rises as it exits the drop, but most of the light is reflected by the drop’s surface. The angle of reflection is equal to the angle of incidence, so the violet ray is reflected more inward than the red ray. This causes the order of the stripes to invert. The inverted stripes now refract again, rising (they appear to bend, as they are inverted) as they exit through the surface from which they entered. As millions of prisms refract the Sun’s light, the stripes of colors collectively form what we perceive as a stunning rainbow. From the diagram, it seems that the stripes should be radiated linearly, so why is it that rainbows are arched? Also, the inversion causes violet to be transmitted above red; the arcs are in the order VIBGYOR, so why does the order of the arcs appear as ROYGBIV? Let’s discuss the cause of the inverted order first. Yes, the drops do transmit violet above red, but the violet transmitted by drops high in the sky passes above the observer’s head, whereas the red transmitted by the same drops, in virtue of being transmitted lower, meets the observer’s gaze below. Whereas, the red transmitted by the drops lower in the sky passes below the observer’s gaze, whereas the violet transmitted higher by the same drops, meets it. Transmitted between the red and violet are the rest of the colors. The order of colors the observer sees is therefore the reverse of the order of colors that the drops refract. The seven arcs do seem painted on the sky since they appear to be two-dimensional. However, the Sun and the moon also appear to be two-dimensional disks, but, and I’m hoping you’re aware, they obviously aren’t. They appear to be two-dimensional because we lack the visual cues that accentuate their threefold dimensionality. 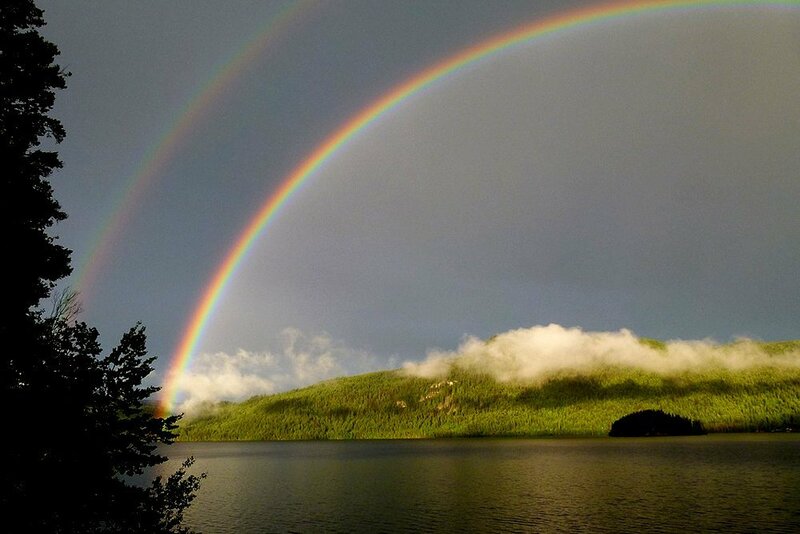 Rainbows are not formed by drops aligned in a single plane; the drops are dispersed in every plane – X, Y and Z. Furthermore, it is the geometry of reflection in three dimensions that causes the rainbow to be, not arched, but circular. Yes, if it weren’t for the Earth’s surface, an observer would witness an elegant, complete circle of colors. Middle school geometry tells us that the colors are refracted out from the drop at the same angle at which the sunlight strikes the drop to produce them. Thus, red is refracted out at 42 degrees and violet emanates at 40 degrees, with the rest of the colors between them. Picture every drop under the raining cloud refracting the colors at these particular angles, in every possible direction. However, a color becomes visible only when the particular angle is drawn with respect to the observer’s eye. With every angle drawn with respect to the observer’s eye, what is formed by the rays and the drops is a beautiful cone. The emerging rays form the sides of the cone as they converge at an angle of 42 degrees to a single point — the tip of the cone — which is, of course, the observer’s eye. Seven cones of different side-to-axis angles are drawn, but what the observer sees are the faces of these cones, which are seven circles. The center of these concentric circles is formed in diametric opposition to the Sun. This is why we are unable to witness a circular rainbow. Instead, we see an immensely arched rainbow adorning the dull sky when the Sun is just above the horizon, but as soon as it sinks, the rainbow disappears. If the Sun could somehow set even lower and still be visible, more and more of that striking circle would be revealed to us. Of course, this isn’t possible. However, the Sun can be found to be even lower and visible when the observer climbs to a higher altitude. 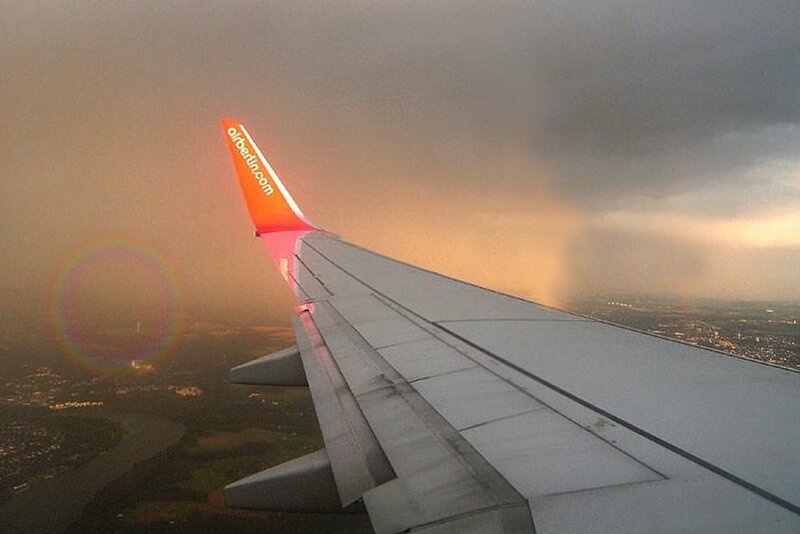 In fact, typically, it is from the window of an airplane that most people find themselves marveling at a halo-like, full-circle rainbow. The Sun’s light doesn’t necessarily have to follow the refract-reflect-refract course; it can, inside the drop, reflect multiple times. 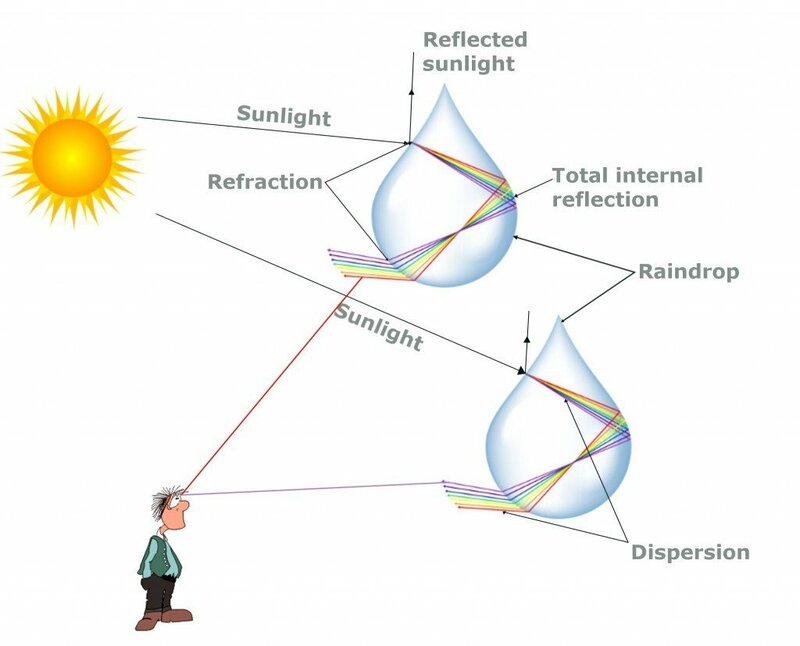 When the light follows the refract-reflect-reflect-refract course in the manner represented in the diagram below, what is produced is called a secondary rainbow. This incredible rainbow is formed above the primary rainbow and is relatively fainter. Observe that because the stripes undergo two reflections, the rainbow that is generated is inverted, meaning that red is transmitted above violet. 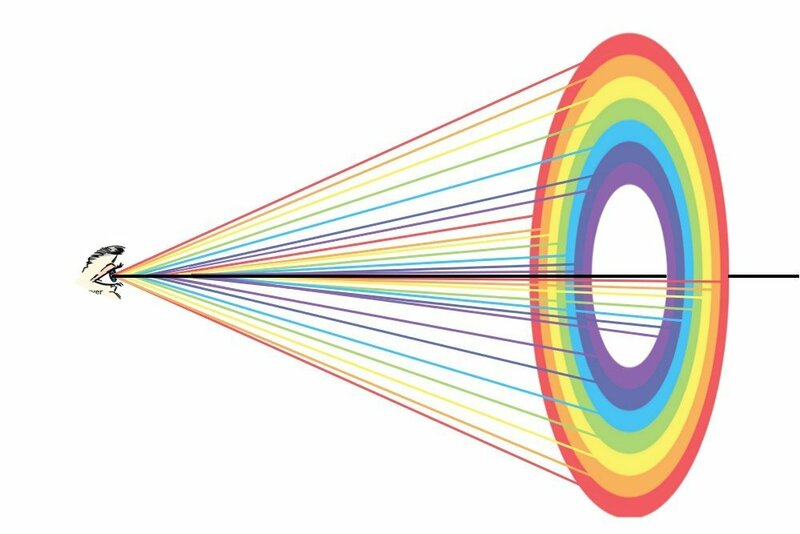 As explained, the way the rays illuminate an observer’s eye renders the rainbow inverted, so the order of the colors of the secondary rainbow is the reverse of the order of the colors of the primary rainbow. However, it is equally breathtaking. And wait… there’s more! The primary rainbow refracts the Sun’s light inward, while the secondary rainbow refracts it outward. This brightens the regions of the sky above the secondary rainbow and below the primary rainbow, leaving the region between them a glum grey. This region is eponymously called Alexander’s Band, for it was first described by the 3rd-century Greek philosopher Alexander of Aphrodisias. At the edges, however, where the brightening begins – above and below the violet arcs of the secondary and primary rainbows, respectively – the colors appear variegated. This is called a supernumerary rainbow. The colors are variegated because the light above and below the arcs forms an interference pattern. 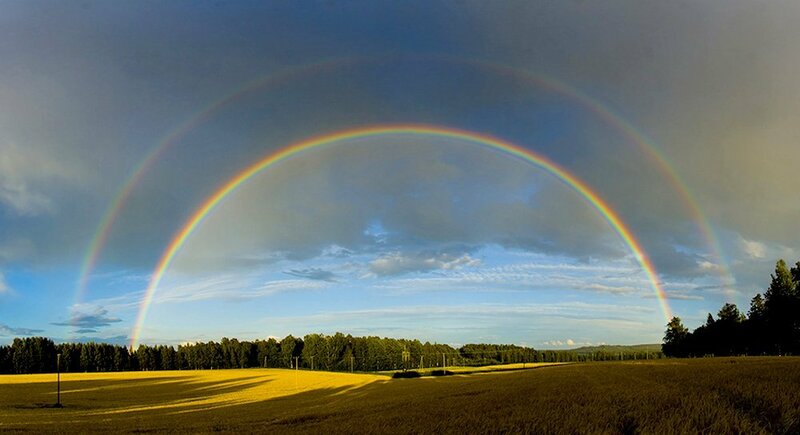 The supernumerary rainbow, therefore, is a gorgeous proof of the wave nature of light. The two rainbows, the abysmal band in between, and the variegated colors — the entire visual seems paradisiacal. Rainbows are not bestowed upon us by the benevolence of the Sun or a weeping cloud; all a rainbow needs to form is a source of white light and drops of water. One can find a vague rainbow, as though a mosaic of colorful droplets, in the mist produced when water crashes upon a rock or in the mist spewed by a pinched hose, sprinkler or fountain. In fact, rainbows can even be formed by the moon! Raindrops refract the moon’s light to generate a moonbow, but due to the moon’s much dimmer light, the rainbows are incredibly difficult to detect. Whatever the source, don’t forget to stand between it and the droplets such that it illuminates your back. Lastly, bear in mind that the cones of colors converge at the observer’s eye. A different point of convergence entails a difference in how the rainbow is being perceived. The intangible rules of geometry ensure that two observers do not and cannot observe the exact same rainbow; the dispersion of colors is never the same for two different people. It is profound, yet alienating and unfathomable, for it is terribly personal, but each sees his or her own rainbows.